Nutrition Facts: (per gummy/bag) Calories: 16.7/450; Total Fat: 0g/0g; Cholesterol: 0mg/0mg; Sodium: 1.4mg/30mg; Total Carbohydrate (100% from sugars): 5g/105g; Protein: 0.3g/6g; % Daily Values based on 2,000 calorie diet: Vitamin A: 0%/0%; Vitamin C : 17%/360%; Calcium: 0%/0%; Iron: 0%/0%. Ingredients: Corn syrup (corn starch, water), sugar, concentrated apple juice, gelatin, oblate powder (potato, corn, soybean), D-sorbitol, acidulant (malic acid, citric acid, sodium citrate), artificial flavor, pectin, carnauba wax, emulsifier (glycerol esters of fatty acids, soybean lecithin). Manufactured on shared equipment that processes MILK, WHEAT, SHRIMP, PEANUT, ALMOND ingredients. 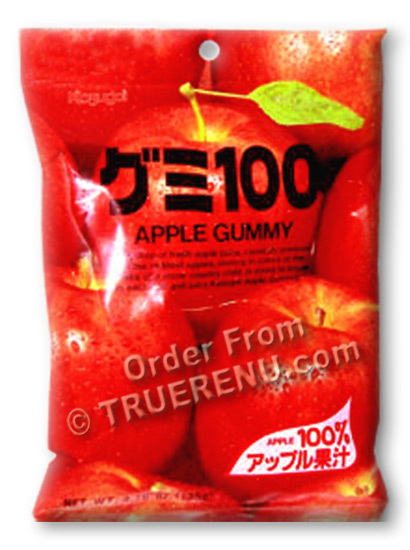 Product Size: Net Weight: 107g, or about 3.77 ounces. Approx. 27 individually wrapped heart-shaped gummy candies in a easy-open bag. Page displayed in: 0.2490 seconds.